The sodium lignosulfonate market has thus far been moderately consolidated, and going ahead too the market is likely to remain this way. In this market, integration of the value chain is a notable characteristic which is serving to up the market share of key players. Several key players in this market are involved in production of raw materials for sodium lignosulfonate that marks their presence at various points in the end-to-end value chain for sodium lignosulfonates. The recovery of the construction sector leading to the development of residential and non-residential structures in several parts of the world is significantly benefitting the global sodium lignosulfonate market. This is because of the widespread demand for concrete admixtures in the construction sector that are based on sodium lignosulfonates. Apart from this, the use of sodium lignosulfonate as well additives in oil production is also boosting this market’s growth. On the flip side, availability of substitutes is posing a challenge to the market’s growth. According to a market study presented by Transparency Market Research (TMR), the global sodium lignosulfonate market is likely to expand at a CAGR of 4.3% for the forecast period between 2017 and 2025. At this pace, the market’s valuation of US$306.47 mn in 2016 will become US$446.14 mn by 2025-end. The report studies the global sodium lignosulfonate market based on a few parameters, viz. type, application, and region. On the basis of type, the sodium lignosulfonate market is divided into dry and liquid. Of the two, dry sodium lignosulfonate dominates the market in terms of both revenue and volume. This is mainly of its vast number of applications such as in animal feed binder, dust suppressants, concrete admixture, and gypsum boards. The key segments into which the global sodium lignosulfonates market is divided based on application are concrete admixture, oil well additives, lead batteries, animal feed binder, agriculture chemicals, dust suppressants, gypsum plasterboards, and others. Amongst all, concrete admixture accounts as the key application segment of sodium lignosulfonate followed by animal feed binder. The report segregates the global sodium lignosulfonate market into North America, Latin America, Asia Pacific, Europe, and the Middle East and Africa based on geography. Amongst all, in 2016, Europe led the overall market holding more than 35% share vis-à-vis revenue. In this region, Germany, Netherlands, Sweden, Spain, Poland, and the U.K. are key importers of lignosulfonates. However, Netherlands, Russia, Germany, Austria, and Sweden are the key exporters of lignosulfonates in the region. However, Asia Pacific is anticipated to surpass in terms of growth potential over the forecast period. This is owing to the vast exports and imports of sodium lignosulfonate in China. In the coming years too, China, India, Thailand, and some other countries in Southeast Asia are expected to display a robust demand for concrete admixtures, which in turn will benefit the sodium lignosulfonate market. North America stands among the top three consumers of sodium lignosulfonates globally. The U.S. constitutes the leading share in terms of demand in the region. Latin America and the Middle East and Africa are relatively small markets for sodium lignosulfonate. However, the demand for sodium lignosulfonate is expected to rise in the upcoming years. Latin America largely relies on imports as the production of sodium lignosulfonate in the region is very low. Borregaard LignoTech, Tembec, Sappi, Burgo Group, and Nippon Paper Industries Co. Ltd. Are some of the leading companies that operate in the global sodium lignosulfonate market. Lignosulfonates are abundantly available wood chemicals. These are commonly obtained as a by-product during the sulfite processing of wood pulp. Sodium lignosulfonate is a highly commercialized lignosulfonate. It has applications in construction, ceramics, animal feed industry, mineral powder, chemical industry, textile industry, metallurgical industry, petroleum industry, fire-retardant materials, etc. Sodium lignosulfonate has applications as concrete admixture, animal feed binder, oil well additives, agriculture chemicals, dust suppressants, lead batteries, and gypsum plasterboards among others. The major application of sodium lignosulfonate is observed in concrete admixture, animal feed binder, and oil well additives. Concrete admixture are water-reducing chemicals which employs sodium lignosulfonate, sometimes blended with other chemicals. Sodium lignosulfonate is primarily used as animal feed binder (pellet binder) in the animal feed industry. The report estimates and forecasts the sodium lignosulfonate market on the global and regional levels. The study provides forecast between 2017 and 2025 based on volume (tons) and revenue (US$ Mn) with 2016 as the base year. The report comprises an exhaustive value chain analysis for each of the segments. It provides a comprehensive view of the market. Value chain analysis also offers detailed information about value addition at each stage. The study includes drivers and restraints for the sodium lignosulfonate market along with their impact on demand during the forecast period. The study also provides key market indicators affecting the growth of the market. The report analyzes opportunities in the sodium lignosulfonate market on the global and regional level. Drivers, restraints, and opportunities mentioned in the report are justified through quantitative and qualitative data. These have been verified through primary and secondary resources. Furthermore, the report analyzes substitute analysis of sodium lignosulfonate and global average price trend analysis. The report includes Porter’s Five Forces Model to determine the degree of competition in the sodium lignosulfonate market. The report comprises a qualitative write-up on market attractiveness analysis, wherein end-users and regions have been analyzed based on attractiveness for each region. Growth rate, market size, raw material availability, profit margin, impact strength, technology, competition, and other factors (such as environmental and legal) have been evaluated in order to derive the general attractiveness of the market. The report comprises price trend analysis for sodium lignosulfonate market between 2017 and 2025. Secondary research sources that were typically referred to include, but were not limited to, OPEC Annual Statistical Bulletin, BP Statistical Review of World Energy, U.S. Energy Information Administration (EIA), International Energy Agency (IEA), Independent Chemical Information Service (ICIS), Chemical Weekly Magazine, World Energy Outlook, Food and Agriculture Organization (FAO), U.N. Comtrade, World Bank, and Global Animal Feed Survey Statistics, company websites, financial reports, annual reports, investor presentations, broker reports, and SEC filings. Other sources such as internal and external proprietary databases, statistical databases and market reports, news articles, national government documents, and webcasts specific to companies operating in the market have also been referred for the report. 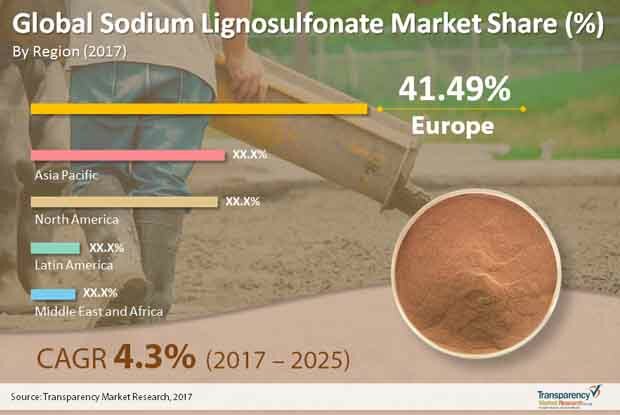 The study provides a comprehensive view of the sodium lignosulfonate market by dividing it into type, application, and geography segments. Sodium lignosulfonate is available in two forms (type segments): dry and liquid. The applications are segmented into animal feed binder, concrete admixture, oil well additives, agriculture chemicals, dust suppressants, lead batteries, gypsum plasterboards, and others. These segments have been analyzed based on historic, present, and future trends. Major application of sodium lignosulfonate is in the concrete industry. However, sodium lignosulfonate face steep competition from a number of substitutes in concrete admixture market such as sulfonated naphthalene formaldehyde, sulfonated melamine formaldehyde, and polycarboxylic ether. Besides the concrete admixtures segment, sodium lignosulfonate face steep competition in other application segments such as animal feed binders and oil well additives. Thus, application-specific substitutes are expected to act as a key restraint to the sodium lignosulfonate market during the forecast period. Regional segmentation includes the current and forecast consumption of sodium lignosulfonate in North America, Latin America, Europe, Asia Pacific, and Middle East & Africa (MEA). Market segmentation includes demand for consumption in all the regions individually. The report covers detailed competitive outlook that includes market share and profiles of key players operating in the global market. Key players profiled in the report include Borregaard LignoTech, Tembec, Sappi, Nippon Paper Industries Co. Ltd., and Burgo Group. Company profiles include attributes such as company overview, number of employees, brand overview, key competitors, business overview, business strategies, recent/key developments, acquisitions, and financial overview (wherever applicable).